Full Color Labels and Stickers. Get the word out with your custom, vinyl stickers and take your business places. From corporate name badges for a convention, labels for containers or boxes, or branding your company name or music band, sticker printing is quick, simple, and an inexpensive promotional item. 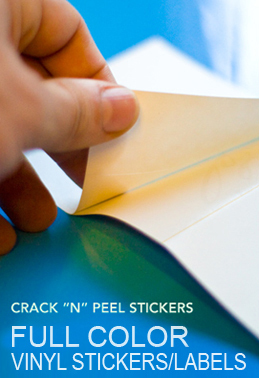 These Vinyl Material stickers are more durable than normal Crack N Peel. Not Intended For Outdoor Use. We can do any square size you need so if you do not see your size here, just send us an email or give us a call and we'll give you a quote.